. This formula is also known as the shoelace formula and is an easy way to solve for the area of a coordinate triangle by substituting the 3 points (x1,y1), (x2,y2), and (x3,y3). The shoelace formula can also be used to find the areas of other polygons when their vertices are known. Another approach for a coordinate triangle is to use calculus to find the area. , where i is the number of grid points inside the polygon and b is the number of boundary points. This result is known as Pick's theorem. is the curve with the greater y-value. is the lateral surface area of the cone. , where s is the length of an edge. d, where d is the diameter. , where B is the area of the base, P is the perimeter of the base, and L is the length of the slant. is the length, w is the width, and h is the height. is the length of one side of the triangle. are the length of each side. is the angle between them. are the base and altitude (measured perpendicular to the base), respectively. is the length of a different side. are the lengths of the two diagonals of the rhombus or kite. the distance (height) between the parallels. is the length of one side of the hexagon. is the length of one side of the octagon. is the number of sides. is the perimeter of the polygon. is the length of the perimeter. are the semi-major and semi-minor axes, respectively. are the radius and height, respectively. are the radius and diameter, respectively. is the area of the square in square units. 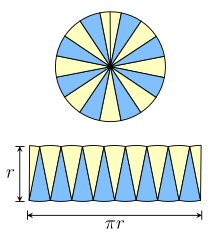 is the area of the circle in circular units. , is larger than that of any non-equilateral triangle. is larger than that for any other triangle. ^ a b c d e f g h Weisstein, Eric W. "Area". Wolfram MathWorld. Archived from the original on 5 May 2012. Retrieved 3 July 2012. ^ a b c d e f g h i j k "Area Formulas". Math.com. Archived from the original on 2 July 2012. Retrieved 2 July 2012. ^ Mark de Berg; Marc van Kreveld; Mark Overmars; Otfried Schwarzkopf (2000). "Chapter 3: Polygon Triangulation". Computational Geometry (2nd revised ed.). Springer-Verlag. pp. 45–61. ISBN 978-3-540-65620-3. ^ Boyer, Carl B. (1959). A History of the Calculus and Its Conceptual Development. Dover. ISBN 978-0-486-60509-8. ^ a b c d e f Weisstein, Eric W. "Surface Area". Wolfram MathWorld. Archived from the original on 23 June 2012. Retrieved 3 July 2012. ^ Foundation, CK-12. "Surface Area". CK-12 Foundation. Retrieved 2018-10-09. ^ Walter Rudin (1966). Real and Complex Analysis, McGraw-Hill, ISBN 0-07-100276-6. ^ Moise, Edwin (1963). Elementary Geometry from an Advanced Standpoint. Addison-Wesley Pub. Co. Retrieved 15 July 2012. ^ a b c d Bureau international des poids et mesures (2006). "The International System of Units (SI)" (PDF). 8th ed. Archived (PDF) from the original on 2013-11-05. Retrieved 2008-02-13. Chapter 5. ^ a b Arndt, Jörg; Haene l, Christoph (2006). Pi Unleashed. Springer-Verlag. ISBN 978-3-540-66572-4. Retrieved 2013-06-05. English translation by Catriona and David Lischka. ^ "Area of Parallelogram/Rectangle". ProofWiki.org. Archived from the original on 20 June 2015. Retrieved 29 May 2016. 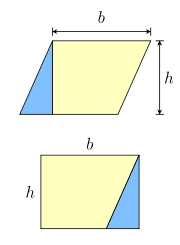 ^ "Area of Square". ProofWiki.org. Archived from the original on 4 November 2017. Retrieved 29 May 2016. ^ a b Braden, Bart (September 1986). "The Surveyor's Area Formula" (PDF). The College Mathematics Journal. 17 (4): 326–337. doi:10.2307/2686282. JSTOR 2686282. Archived (PDF) from the original on 27 June 2012. Retrieved 15 July 2012. ^ Trainin, J. (November 2007). "An elementary proof of Pick's theorem". Mathematical Gazette. 91 (522): 536–540. ^ Matematika. PT Grafindo Media Pratama. pp. 51–. ISBN 978-979-758-477-1. Archived from the original on 2017-03-20. ^ Get Success UN +SPMB Matematika. PT Grafindo Media Pratama. pp. 157–. ISBN 978-602-00-0090-9. Archived from the original on 2016-12-23. ^ a b c Weisstein, Eric W. "Cone". Wolfram MathWorld. Archived from the original on 21 June 2012. Retrieved 6 July 2012. ^ Mandelbrot, Benoît B. (1983). The fractal geometry of nature. Macmillan. ISBN 978-0-7167-1186-5. Archived from the original on 20 March 2017. Retrieved 1 February 2012. ^ a b Chakerian, G.D. (1979) "A Distorted View of Geometry." Ch. 7 in Mathematical Plums. R. Honsberger (ed.). Washington, DC: Mathematical Association of America, p. 147. ^ Dorrie, Heinrich (1965), 100 Great Problems of Elementary Mathematics, Dover Publ., pp. 379–380. ^ Minda, D.; Phelps, S. (October 2008). "Triangles, ellipses, and cubic polynomials". American Mathematical Monthly. 115 (8): 679–689: Theorem 4.1. JSTOR 27642581. Archived from the original on 2016-11-04.